March 24, 2014 By Tina M 8 Comments This post may contain affiliate links. Read my disclosure policy here. Hi Everyone! It’s Monday, which means I am giving you another list of resources to print out and add to your mommy book! The whole point of this book is so that you don’t have to run to your computer every time you need a fun activity to do with you kids. Just grab them from your book or filing cabinet, and you are ready to go! Being a fun mom is much easier if you are prepared! If you missed last week, we printed off a year’s worth of Scavenger hunts! So fun. 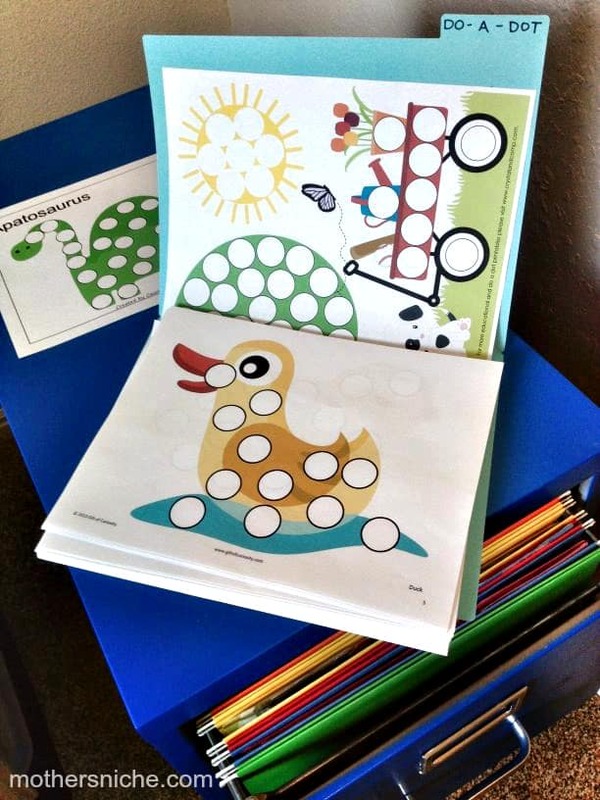 This week we are doing Do A Dot Printables! These are so stinking fun (and educational too)! 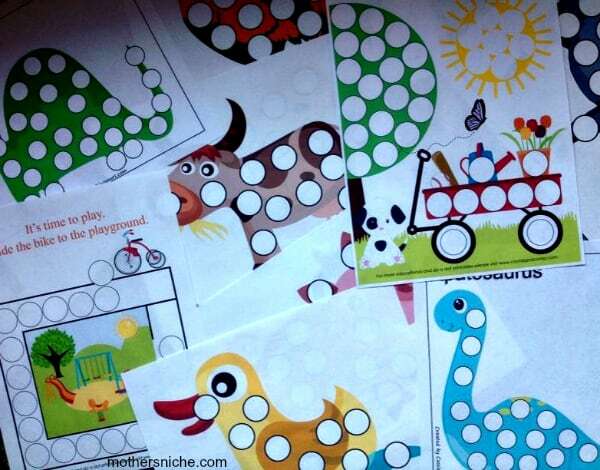 There are some basic printables for the young ones (just put a dot on the circle), and their are more advanced ones for the older kids (Do a Dot math, Do a Dot numbers, as well as mazes and puzzles). Typically I would show you some pictures of my toddler using the printables, but guess what? I’m waiting for my do a dot markers to arrive! Sadly, I saw those “bingo markers” at the Dollar Tree and thought they would work great (and be a little bit cheaper). Unfortunately, they were so crappy. They were leaking everywhere and making a big mess (and I’m an adult). I didn’t even let my toddler try them. I’m returning the rest tomorrow. Just in case you were thinking the same thought, don’t do it. If you don’t have Do A Dot markers (and they aren’t in your budget quite yet), you really don’t have to have them RIGHT NOW in order to have fun with the worksheets and printables. 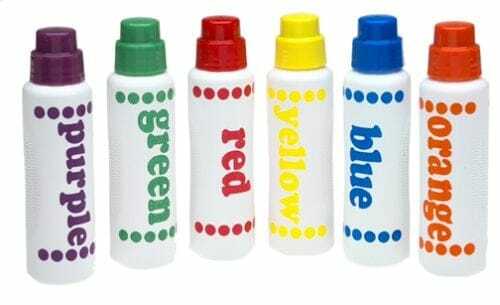 If you don’t have the markers, just use stickers or pom-poms! In fact, You might want to check out my post on Pom Pom printables, because they will probably work with do a dot markers too! And be sure to follow my Do A Dot board on Pinterest so that you can continue to add to your collection! What Would You Like to See Next Week? Perhaps I’m not with it, but what’s the point of these? I understand coloring pages and dot-to-dots, but what’s the appeal here? Can someone enlighten me? They are great for motor skills, but more importantly for me is the mess-free factor! Not having to pull out a bunch of paint, and brushes, and cups of water make it much more likely that I will sit down and paint with my toddler for a quick activity! Thank you for sharing all of these links! I have one very happy toddler!! Hey!! I spy some of my printables. Thanks for sharing. You might want to check your links … the fruit printables links to a website that sells refurbished dell laptops! Love this site. <3 Thank you for making your page clean, simple, and easy to navigate. Thank you! You are a weetheart!